RNA is made through transcription, where an enzyme called RNA polymerase transcribes the DNA sequence into a complementary version with the use of free RNA nucleotides. Three of the bases (adenine, guanine, and cytosine) are the same as in DNA, but the fourth (thymine) is replaced by uracil in RNA. Also, the backbone is slightly different, containing a ribose instead of a deoxyribose sugar. Transcription begins at the promoter, which is a location in the DNA that signals the beginning of a gene. In bacteria, RNA polymerase binds to the promoter and transcription proceeds in the 5′ to 3′ direction until it encounters the terminator sequence, where it stops. The newly made mRNA molecule is then bound by the ribosome to begin translation. In fact, protein synthesis can begin immediately in bacteria once part of the mRNA is available for binding. This is because in bacteria transcription and translation, both happen in the cytoplasm and also because the mRNA doesn’t have to be processed prior to translation. Ribosomes bind to and start translation of mRNA before it’s even finished being transcribed. In bacteria and archaea, many genes are organized into groups that are transcribed together, called operons. The operon has one promoter, which signals the start of transcription, followed by several genes next to one another and ending with a transcriptional termination sequence. Transcription of an operon results in an mRNA, called polycistronic mRNA, which codes for several proteins, each of which are translated in sequence. Grouping genes into operons is a way for the cell to coordinate the expression of genes that will be needed at the same time. Transcription in eukaryotes is similar to transcription in bacteria except that after the mRNA is made, it has to be processed and then transported out of the nucleus to the cytoplasm for translation. A cap is attached to the mRNA so that it can be recognized for translation by the ribosome. 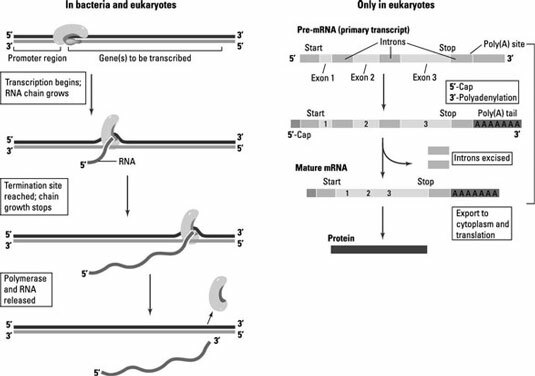 The protein coding sequence of eukaryotic genes is interrupted by non-coding regions called introns that are transcribed by RNA polymerase but are later removed, or spliced, during RNA processing. The mRNA is trimmed and a string of A’s is added at the end, called a poly A tail. The poly A tail makes the mRNA stable and helps identify it to the ribosome as a sequence to be translated. Mature mRNA is exported from the nucleus to the cytoplasm to be made into protein by ribosomes. Archaea have promoters and RNA polymerase that are similar to those in eukaryotes, but transcription is regulated as in bacteria. Many archaeal genes are found in operons; some, but not all, have introns.